A relatively new region by California wine making standards, Temecula wine country is quickly catching on as a hot-ticket tourism destination in sunny Southern California. This bucolic stretch of Riverside is today home to more than 35 wineries and a popular food and wine festival that draws hundreds of curious oenophiles each year. Wineries in Temecula have been quick to respond to the area's new popularity, with many boasting sprawling grounds and spacious tasting rooms. Wedding facilities are also common at wineries, as are live music venues, and seasonal events. Visitors to Temecula and wine country can also indulge in balloon rides, golf and spa treatments or forage for treasures at the area's more than 600 antiques dealers. Another popular attraction, is the Pechanga Resort and Casino, the largest casino in the state of California, live performances, dancing, fine dining and golf. Your vacation estate features: : Perfectly situated, showcases endless majestic views of wineries, vineyards, morning hot air balloons hovering over the valley, and painted romantic sunsets to finish out your perfect day with loved ones and friends over a glass of fine wine. Luxuriously appointed furnishings with comfortable sleeping accommodations for up 4 people include two master suites, each featuring a queen bed with luxurious bedding, closet, a 3/4 bathroom. Living room, formal dining room, and gourmet kitchen. Very private and secure. Attractions: : The Temecula Wine Country with over 35 award winning wineries. Enjoy wine tasting, fine dining, tours, music concerts, hot air ballooning, and horseback riding. Old Town Temecula has been around since 1882 when the California Railroad came through the valley and local investors created the first Bank, and retains many historical features. It's an absolute delight! Enjoy the sense of adventure and wonderment as you take time to explore Old Town Temecula's many alleyways with a new exciting discovery around every turn. Here you will find an amazing array of specialty stores, exclusive boutiques, restaurants, art galleries, and a myriad of antiques stores which together with whimsical and historical features that make Old Town Temecula what it is. Other nearby attractions include the Pechanga Casino – the largest in California, the San Diego Zoo, Seaworld, Disneyland, San Diego Wild Animal Park, seven local golf courses, and white sandy beaches within a short drive. Downtown San Diego 60 minutes away. Old town Temecula 15 minutes. Panoramic view of Temecula Valley and the Wine Country. Only compatible with I-phone, I-pod. This home features a gourmet kitchen and luxury accommodations. Wifi available. I was here for over a month and every minute was fantastic. The home is very well appointed and extremely comfortable, not to mention the expansive views of the valley from the front door. The view is an amazing treat to wake up to, and the sunsets are simply stunning. 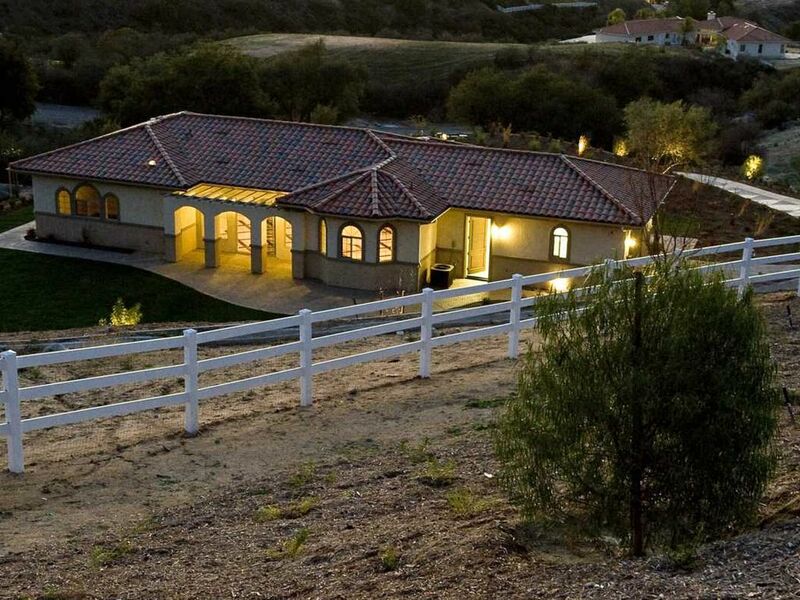 The location is quiet, private and super close to all of the Temecula wineries. The management is top notch and I wouldn't hesitate for a second to come back and stay. Great view...watch the hot air balloons each morning. House was clean and well laid out for two couples. The key box on the door was the only obstacle that was needed to overcome. The house overalll was great with exceptional views of the Temecula wine country. Given the price that we paid to stay here it could have been nicer. The kitchen faucet was ready to collapse. There wasn't enough toilet paper nor were there napkins or Kleenex. Those are just small things that should have been there. Also in the front bath several lights were missing. Also, not having a key pad for the garage door was an inconvenience. The the code box getting into the front door needs to be replaced. Several things are just worn out. And when you call your house a 5 star luxury Place it should reflect that. It's the litttle things that mean a lot. Property was well maintained. The house was spotless. The house was great!!! Fabulous location with fantastic view. Kitchen was amazing. We had a very relaxing stay and hope to return in the future. Beautiful home in a great setting. Could watch hot air balloons every morning and sunset every night. Close proximity to wineries and short drive to Old Town. No Wi-Fi available. We had some difficulties with the combination to the drive, but a phone call fixed the problem. We would recommend to family and friends. Golf: Redhawk - Rated 7th Best among California's public golf courses, Redhawk Golf Course in Temecula makes a lasting impression. The gentle contours of this Ron Fream design present a wonderful challenge for golfers of every level. Temecula Creek - Temecula Creek features 27-Holes of Championship Golf surrounded by over 300 acres of rustic beauty, dramatic elevation changes, sweeping mountain views and year-round sunny weather. Journey - The golf course, routed over the beautifully rolling terrain between Pechanga Creek and the adjacent mountainside, weaves its way through numerous stands of mature California live oaks and provides stunning vistas of the Temecula Valley and the surrounding mountains.The course was designed by Arthur Hills and Steve Forest. CrossCreek - Cross Creek Golf Club's design features rolling hills, rippling creeks and groves of age old oak and sycamore trees make the Cross Creek Golf Club a place of resplendent natural beauty. Temeku Hills - Temeku Hills Golf and Country Club, has become one of Temecula's premier golfing facilities. This 6,636 yard Ted Robinson Design was opened in 1995 to rave reviews. Temeku Hills offers a rolling topography with five lakes, numerous doglegs, beautiful challenging greens, and four sets of tees to accommodate all golfers. 2-NIGHT STAYS ARE ALLOWED WITH A RENTAL RATE OF $499 PER NIGHT. PLEASE INQUIRE FOR WEEKLY STAYS OF 7 NIGHTS OR MORE. *CLEANING FEE $150. *WEDDINGS ARE NOT PERMITTED. *PARTIES ARE NOT PERMITTED. *PETS ARE NOT PERMITTED.